Apart from the neighboring Acadia National Park, Bar Harbor is close by many wonderful attractions, both on Bar Harbor and nearby. Located directly south of Bar Harbor and off the southern coast of Mount Desert Island, the famed Cranberry Isles and the natural attractions are easy to reach by schedule passenger ferry or water taxi, and well worth exploring. 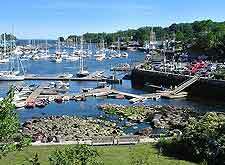 A small and wealthy town south 75 miles / 121 km to the west of Bar Harbor and north of Rockport, Camben lies alongside Penobscot Bay, where is has become somewhat of an upscale seaside resort. Other attractions include both the town of Tremont and Trenton, in Hancock County, and also the charming village of Seal Cove, which lies on the southwesterly coast of Mount Desert Island and is the perfect place to enjoy a scenic picnic. 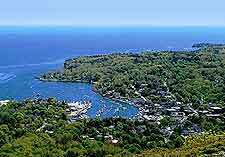 The main attraction of Camben is simply is sheer beauty and seaside appeal, as this town is generally thought to be amongst the most attractive in New England. With gorgeous rolling hills and also a spreading oceanfront, Camden's harbor looks doubly impressive when filled with its fleet of traditional sailing ships (windjammers). 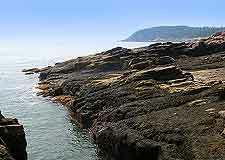 Camden's coastline is quite rocky and so Laite Beach is the only sandy beach of any description. If you have time, hike or drive to the top of Mount Battie and enjoy the endless views. Named after the sheer quantity of cranberry bushes which grow around the island, creeping just above ground level. The Cranberry Isles offer a number of attractions, providing tranquility, away from the noticeably busier Mount Desert Island and Acadia National Park. Great Cranberry, Little Cranberry and Sutton are the main islands within this group, with Great Cranberry being to biggest and home to attractions such as the Cranberry House and Museum, the Whale's Rib Gallery, and also Hitt's Home, a historical museum based around an award-winning children's story. Countless small yachts and boats are always anchored close to the shoreline pathways and benches. The vintage automobile attractions at the acclaimed Seal Cove Auto Museum are the reason that so many tourists come here, with more than 100 cars of all descriptions, along with numerous antique motorcycles. Seal Cove is generally considered to be a community of the neighboring Tremont township. 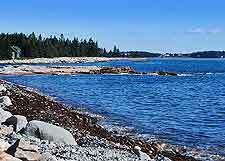 Tremont lies on the southwestern side of Mount Desert Island, to the south of Seal Cove and north of Bass Harbor. Easily reached from Bar Harbor, the main attractions of Tremont are to be found within its surrounding communities and include the 19th-century Bass Harbor Head Light, the Ketterlinus Nature Preserve and the Ship Island Group Preserve. The Tremont Museum and Historical Society may also be of interest and is full of local memorabilia. 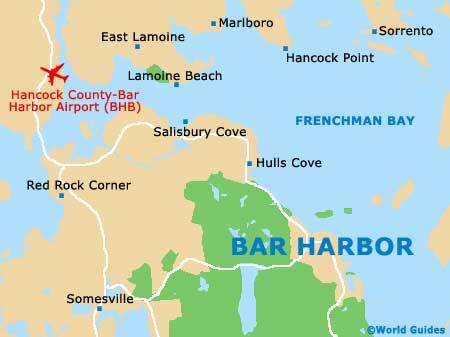 A small and popular town, Trenton lies on the mainland and just across the northerly Bar Harbor Road Bridge, being situated next to the Hancock County Bar Harbor Airport, being just a 20-minutes drive away. Much of this area tends to be quite rural, with no actual town center as such and most shops being spread along the main road to Ellsworth. However, it is not the shopping attractions that draws tourists here, but the scenic flights offered at the airport by Acadia Air Tours, which take passengers high above the Acadia National Park, in either a glider or even a old-fashioned biplane.